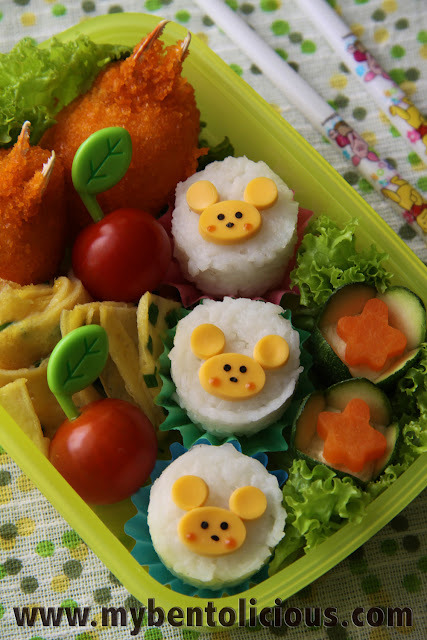 Today, I run out of veggies in the refrigerator so I make bento using cheese as a rabbit-shaped decoration on the top of the white rice. I put fried breaded crab claw and make a chives omelet. In addition, I also put the cherry tomatoes and use carrots and cucumbers for garnish. these are just too sweet! @CJane : thanks Cindy, are you feeling better? This is so cute! Beautiful bento!